Knorr Mashed Potato is made from 99% quality German potatoes! Versatile - use in savoury dishes, baked goods, etc. 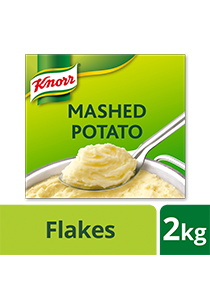 Knorr Mashed Potato is an easy to use product that gives you consistently great tasting mashed potatoes every time. 99% Potatoes, Emulsifier Mono and Diglyceride from Fatty Acids (E471), Stabiliser Disodium Diphosphate (E450), Spice Extract (Contains Wheat), Antioxidant Sodium Metabisulfite (E223). All food additives are of plant and synthetic origins. Knorr Mashed Potato is made with potatoes from Germany, to deliver great tasting mashed potatoes in just 5 minutes. With no added milk or seasoning, it can be perfectly adjusted to your individual needs. Boil 9 liters of water with 70g salt. Add 4 liters of cold water (or milk). Important: Do not exceed temperature of 85°C. Briskly stir in 2kg potato flakes with a wired whisk.